It's an all girl household here so EVERYTHING just has to be pink and very girly! We always find it really difficult to buy 'pretty' collars as our local pets stores only stock the plain boring ones! When Salt Dog Studios wanted us to team up for a review opportunity we were both over the moon. 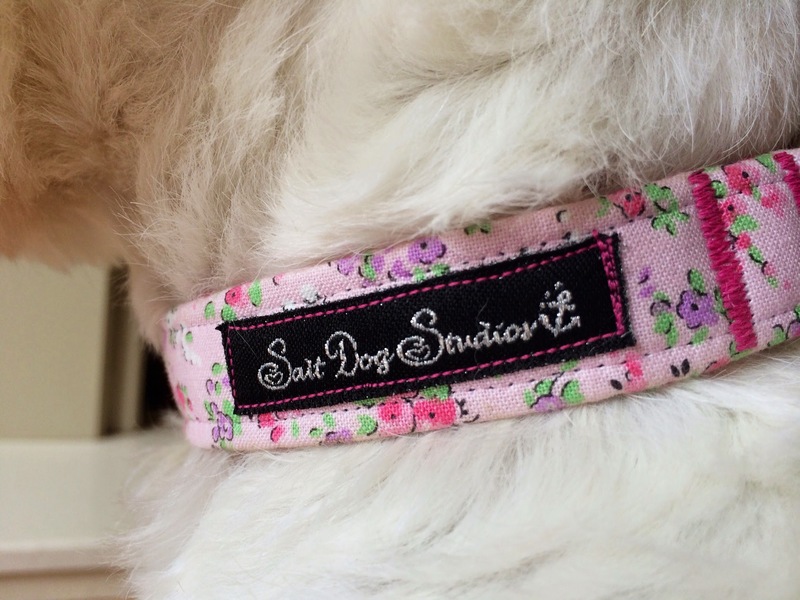 They stock a gorgeous range of collar, leads, bandanas and much more. So what's the story behind Salt Dog Studios? Well, they are a small family run business based in Whitstable, Kent right here in the UK. They design handmade products using the highest quality fabrics, and strive for only the best for your pet. They offer a great customer service, for a very affordable price. Lottie certainly isn't your average size Westie (what's normal anyway, we always say). She is a little on the small size, meaning we normally struggle to find collars and harnesses that fit like glove. So we were both thrilled to discover that Salt Dog Studio collars are all handmade to order giving you the perfect fit to any size dog! 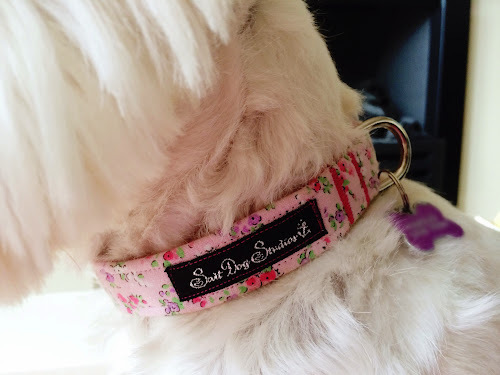 It's so nice to think they made the collar especially for Lottie, it gives it that personalised feel you would struggle to sense in a big pet superstore. I was taken aback with the outstanding customer service and care I recieved for a product for review. They handmade Lottie's collar, perfected the size so it fits her like a glove, let us choose which design we would like (this was definitely the hardest decision, they are all gorgeous) and even wrote us a handwritten note. All this from a small family run company is hard to believe! Something some of the big retailers could definitely learn from. 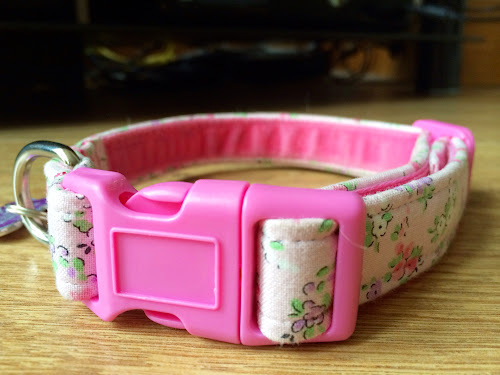 For review we choose the stunning Pink Gracke Fabric Dog Collar. From the moment we opened the wrapping, well Lottie did (she got a little bit too excited and ripped it before I could even take a photo) I was impressed' the packaging certainly didn't let this high quality product down and it gave it just that little extra touch. The collar itself was velvet lined inside, with a beautiful pattern on the front. It has a larger D ring than Lottie's previous collar which I find extra helpful as I can sometimes struggle to attach her lead to her old one. We took it for a quick test spin around the block and it soon came apparent that it was one tough cookie, partly down to its webbing core, so we won't be needing a replacement any time soon. As if that wasn't good enough it also washable at 30 degrees, which can really come in handy if your dog is like Lottie and loves to roll in really anything smelly. 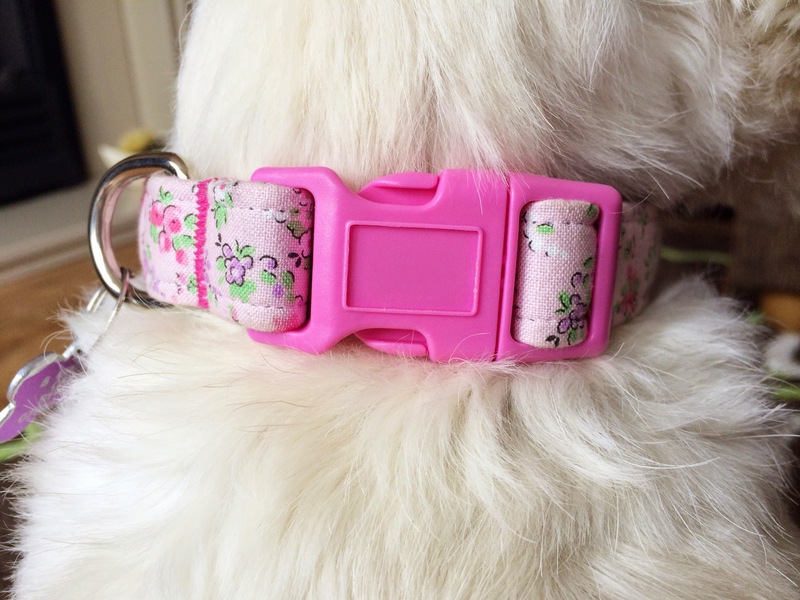 All there collars come in a range on sizes, widths and styles. As well as fabric, they also do ribbon and hemp collars so they really do cater for any taste. They can also customise collars into half checks, or add different buckles on to suit your needs. Not sure of the size you require, don't worry, they will be more than happy to help with any sizing queries too. The particular collar they sent me in Lottie's size is £17.99. They cater for all different sizes and prices range from £9.99 for extra small upwards. After a full weeks use we were so impressed with this beautiful collar I have decided to purchase the matching lead. We can't wait for it to arrive, so we can definitely walk in style. To browse there beatiful range of products click here. 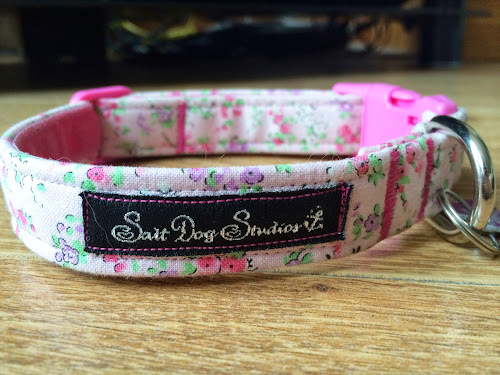 We received a dog collar from Salt Dog Studios at no charge in exchange for our honest and fair review of the product. All opinions expressed here are our own and truthful! So pretty and you look just darling!! We are going to go check them out, mom's been looking for some new collars for us! Thanks for sharing!